People often refer to a group of fish as a school, although this term is not precisely correct. A school is a group of fish that swim together in a synchronized fashion, moving in the same direction, at the same speed, and turning simultaneously. To be called a school, a group of fish must demonstrate all of these rather complex behavioral patterns. The word shoal, on the other hand, is the term for any simple social grouping of fish. In short, any group of fish is a shoal, but not all shoals demonstrate the properties of a school. Shoaling offers numerous benefits to individual fish, including increased success in finding food, access to potential mates, and increased protection from predators. With respect to food acquisition, it has been shown that fish in shoals find food faster and spend more time actually feeding. This benefit probably stems from the simple fact that a large group of fish has a greater chance of finding food than does one single individual. With respect to mate acquisition, shoaling behavior often results in groups of fish of the same species, thus making it easier for males and females to find each other. For both food acquisition and mate acquisition, larger numbers of fish should lead to increased benefits, therefore it is not surprising that fish typically choose large shoals over small shoals. With respect to predator predation, it has been shown that fish in shoals are at less risk of predation than fish that are swimming alone. This benefit has been extensively studied and may be related to a number of different features of the shoal. For example, each fish in the shoal benefits from a phenomenon known as the numerical dilution effect, which suggests that simply being part of a group reduces the chances of being killed. In a shoal of one hundred fish, each individual has only a one-in-one-hundred chance of being killed during an attack. This benefit, as with foraging success and mate acquisition, increases in value as the size of the shoal increases and may be another reason why fish choose large shoals over small shoals. Another important consideration, with respect to the anti-predator benefits of shoaling is the confusion effect. This phenomenon is associated with the high degree of similarity between members of a shoal. In theory, the confusion effect suggests that a predator, confronted with a large group of similar-looking individuals, experiences perceptual confusion, which slows the attack. This may occur because the predator has difficulty identifying a single individual fish to attack. Conversely, in a phenomenon known as the oddity effect, an individual fish that does not resemble the other members of the shoal will attract a predator’s attention. 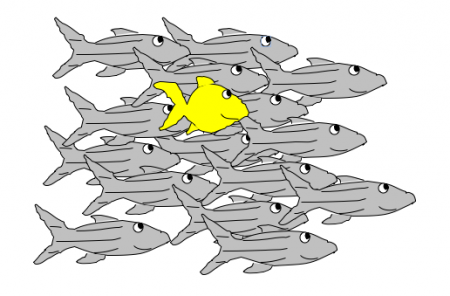 For example, imagine a bright yellow fish shoaling with a group of grey fish. An approaching predator will be drawn to the yellow fish as it stands out in stark contrast to the rest of the group. Since fish change shoals on a regular basis, individuals are often faced with the decision of which shoal to join. Joining the ‘correct’ shoal is critical, especially with respect to the confusion and oddity effects, which depend on an individual’s ability to ‘blend in’ with its shoalmates. Joining the wrong shoal could have disastrous consequences. Most shoaling studies, however, indicate that fish are very good at choosing shoalmates with similar characteristics to themselves. The study of shoaling behavior is relatively easy. Test tanks (like the one used in Fish Cam) are aquariums divided into thirds by the addition of two panes of glass. “Target” shoals are placed into the end chambers and an individual test fish is added to the central chamber. During an experiment, the time the test fish spends near each end chamber is recorded. Increased time near one end indicates a preference for the shoal in that chamber. When you open Fish Cam you will see a standard 20-gallon aquarium that has been divided into thirds with the addition of 2 glass panels, eight inches from each end wall. The central chamber is partially divided by two opaque baffles. The test fish can move freely through the central chamber, but cannot see both end chambers simultaneously. Each day we will add a new test fish to the central chamber. The end chambers will either be empty or will contain shoals of fish. To monitor the preference of the test fish for each end chamber, simply measure the amount of time the test fish spends on each side of the central chamber within a 10-minute observation period. A centerline, drawn on the front pane of glass will separate the central chamber into left and right halves.